Traction is on my mind this morning after a slip-sliding adventure to the bus stop over ice-glazed sidewalks so slick they might as well have been Zamboni’d for a hockey game. To prevent a tail bone-cracking, face-planting splat of pain and ignominy, here’s a quick round-up of the grippiest, most durable traction systems for your footwear. Kahtoola was one of the pionerring companies in the entirely new genre of winter traction. Their hyper-durable slip-on traction system falls somewhere between a pair of full-on crampons and a lightweight pair of snow walkers such as the YakTrax Walk (more on the pros and cons of YakTrax below). Though the MICROspikes ($59) are perhaps a bit too aggressive for regular around-town sidewalk use, they have been my all-purpose go-to option for more than 5 years. 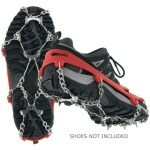 Despite heavy use and abuse on everything from frozen streets to icy backcountry trails, they have performed flawlessly. As a further testament, Backpacker magazine recently awarded the MICROspikes one of their 2012 Editors’ Choice Gold Awards, which honors exceptional outdoor gear that has withstood the test of time. The original, and to many folks, the best winter traction system out there. Produced in Biddeford, Maine, for nearly 20 years, STABILicers Originals ($49) were one of the first winter traction devices to hit the market. 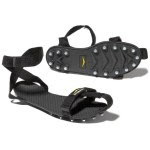 A more recent entry into the field, the ICETrekkers Diamond Grip ($41) are basically a slightly different, slightly less aggressive take on the MICROspikes. They slip on using a similar stretchy rubber harness system, but instead of short, sharp vertical teeth underfoot, they use a lower-profile multi-toothed chain for grip. This will be the third season they’ve been available and they have been garnering some excellent reviews. 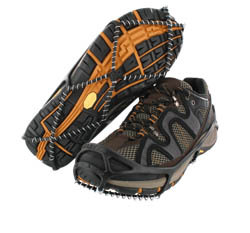 YakTrax is almost certainly the most well-known company that produces winter traction options and the YakTrax Walk ($20) and Pro ($30) are two of the most inexpensive models out there. I mention them here only because of their prevalence, not because I particularly recommend them. They are much less durable than the three options above and don’t hold up to regular use and abuse, plus they provide much less grip underfoot, especially for walking on ice. If you only need an option for a few rare occasions, however, they can be a good choice. Interestingly, the company recently released the XTR Extreme ($60), in a clear effort to play catch-up with its competitors in this space.